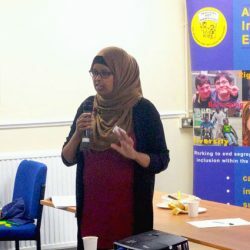 My name is Warda Mohamed and I am the disability support worker at Ealing Centre for Independent Living (ECIL). I was very interested in part taking in this training programme; I was looking to gain more knowledge/insight into issues concerning Disabled young people. Education was one area that my organisation didn’t really deal with, however I thought it was important to engage with schools and young people whilst they are in education. Really because there isn’t enough support available for Disabled people of working age within Ealing. Many of them have not had any support since leaving education and have lost confidence as a result. They struggle to get work and struggle to even integrate in to the community as much as they should. Many of my younger clients have had various different but negative experiences in school which have left a lasting impact; I wanted to learn more about these issues. I also intended to learn tools to help better engage with younger people to help change the face of our DPO. I thought that the best places to reach to them would be to work more with schools, colleges and universities. I attended all of ALLFIE’s training sessions. Through this training I have gained valuable insight into the differences between integrated and inclusive education. I realised the history and the impact that segregated education has had on individuals and on the wider society. I learnt about the challenges and opportunities that schools face when wanting to become inclusive, as well understanding the different perspectives of all the key players in order to make it work. This includes the young people, teaching staff, parents, law makers and local authorities. The Knowledge is Power toolkit, in particular, has really given me an excellent starting point to help recruit the next generation of Disabled young people to be involved in ECIL. I believe that I now have increased practical knowledge of methods of engaging effectively with young people and their schools, with the vision to help all key members embrace inclusion, rights and aspiration. I have now already identified a small group of young people who have started a voluntary programme to create a young Disabled people group. This group have started helping me recruit even younger people from our local colleges. We have started with Southall College and the head of department stated she was worried about the lack of support available for her students once they leave college. We have started providing voluntary opportunities for some of the pupils on the day they don’t have college, in order to introduce them to ECIL and help them prepare for the transition of leaving college. I plan to arrange a day training with the young people soon, where we will use the ALLFIE toolkit. I have personally gained a lot of growth from this training and I feel much better equipped to promote the principles of inclusive education.